Sens. Lisa Murkowski and Dan Sullivan both voted for the GOP-sponsored tax reductions that passed the Senate early Saturday — a step that also brings the Arctic National Wildlife Refuge to the brink of being opened for oil leasing. The senators, both Republicans, said the bill would be good for Alaska's economy and its middle class, as critics denounced the measure as a hastily written giveaway to corporations and the wealthy. "This tax reform bill will go a long way in helping hard-working, middle-class Alaskans, who are suffering due to a recession," Sullivan said in a prepared statement. Murkowski, in a conference call with reporters at 2:30 a.m. Saturday in Washington, D.C., acknowledged Democrats' complaints about getting last-minute drafts of the bill with handwritten adjustments in the margins. But she also said the legislation's major components had seen plenty of public debate in committee hearings — particularly the provision to open a portion of the refuge to drilling. "Do I wish that we would have allowed for that full, written text to be distributed and reviewed? Yes. I'm not going to make excuses for that," she said. But, she added: "We have made no secret about the desire to open ANWR. Every single Congress there have been bills to do that. We have had hearings on it." Murkowski added that she would have voted for the legislation even without the refuge provision. She and Sullivan also each got amendments added to the final bill that benefit Alaska Native corporations and cruise lines. Drilling proponents, meanwhile, can't crack their champagne corks just yet: The Senate's ANWR proposal is still expected to go before a conference committee of senators and House members, who would sort out differences between the two tax bills approved by each chamber. 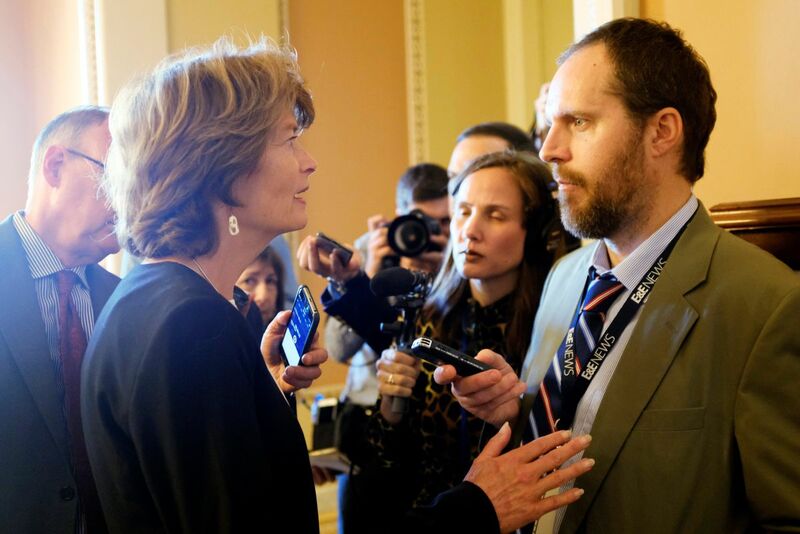 Murkowski said she hopes to be named to the conference committee, adding that she's also pushed for Rep. Don Young to be one of the House members. There's at least one sign that not all GOP House members are on board with the Arctic drilling proposal, which isn't in the House bill: A dozen Republicans sent a letter Thursday to House Speaker Paul Ryan and Senate Majority Leader Mitch McConnell registering their opposition. Senate Republicans had to adjust their bill to fix a problem that their parliamentarian — a sort of legislative referee — raised with the ANWR provisions written by the Senate Energy Committee, which is chaired by Murkowski. The problem had to do with arcane Senate rules; the parliamentarian, according to news reports and an account from Sullivan, essentially said that a section of the ANWR language hadn't been approved by the right committee. That in turn raised questions about whether the legislation could meet requirements that it generate a certain amount of cash for the federal government. Republicans made two resulting changes to the bill. One requires the U.S. energy secretary to sell 7 million barrels of crude oil — up from 5 million — from the nation's Strategic Petroleum Reserve in 2026 and 2027. The other requires the U.S. Department of Interior to manage the refuge drilling program "in a manner similar to the administration of lease sales" under a 1976 federal law, instead of "in accordance with" the 1976 law. The array of environmental groups and lawmakers opposed to drilling in the refuge didn't address the revisions in their statements condemning Saturday's vote. "We don't know the exact meaning of the language change yet, but overall, Sen. Murkowski is trying to bypass the environmental protections that would normally apply to a wildlife refuge," Suzanne Bostrom, an attorney with the environmental law firm Trustees for Alaska, wrote in an email Saturday. Murkowski, in a floor speech Thursday, disputed that, saying the legislation doesn't waive the National Environmental Policy Act "or other environmental laws." "We will not sacrifice wildlife or the environment for the sake of development," she said. Murkowski and Sullivan got additional priorities into the bill; they offered amendments earlier in the week that were incorporated into Republicans' final version of the legislation. One of Murkowski's amendments gives Alaska Native corporations the ability to deduct, from their taxable income, donations of cash or assets to "settlement trusts." Those trusts manage Native lands and support Alaska Natives' health, education and economic welfare; they're designed to shield land and other assets from the corporations' business risks. Only a few Native corporations have established and maintained settlement trusts, including the Kodiak Island-based Old Harbor Native Corp., its chief executive, Carl Marrs, testified earlier this month before a Senate committee. But updates to the tax code, Marrs testified, haven't addressed "the significant federal tax issues that settlement trusts present." Murkowski, in her conference call early Saturday, described her amendment — versions of which she and Young have previously introduced — as "another tool" for Native corporations "to ensure that their respective shareholders receive benefits." Sullivan, meanwhile, got his colleagues to strip out a $70-million-a-year tax hike on cruise ships that had been proposed by the Senate. A cruise industry publication, Seatrade Cruise News, said that foreign-registered, U.S.-based lines are exempt from corporate income tax under two sections of the American tax code — though land-based income from tour operations in Alaska is taxable, the publication reported. A spokesman for Sullivan, Matt Shuckerow, said the proposed increase would have "disproportionately impacted the Alaska economy and its workers, particularly in communities that rely on cruise ship tourism." "For the many ports of call throughout the Inside Passage, and elsewhere across Alaska, this amendment was important to ensure local businesses and tourism-reliant communities — who rely on the more than one million cruise ship passengers who visit Alaska each year — would not be negatively impacted by this bill," Shuckerow wrote in an email. Sullivan received the third-highest amount of campaign cash from cruise ships and lines in 2016 — $23,500 — according to data collected by the nonpartisan Center for Responsive Politics. Murkowski was No. 2. The cruise industry's top advocate in Alaska, John Binkley, said in a message that Alaska communities, not cruise lines, would have been hurt by the tax proposal. "They just move their ships to where they are most profitable," wrote Binkley, whose family owns the Anchorage Daily News. "Alaskans, who depend on the jobs created by passenger spending, would be the losers when ships move." Correction: The Senate parliamentarian's objection to the ANWR language in the tax bill was to a specific reference to the National Environmental Policy Act – not to the entire ANWR section, as the story originally said.